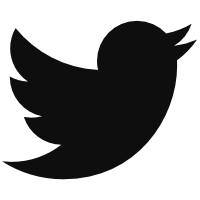 I have followed Justin Smoak’s career with interest. Before I was covering major league baseball, I reported on college athletics in South Carolina, first covering the Chanticleers of Coastal Carolina and later Clemson. During this period, Smoak became regarded as one of the best college players in the game while at the University of South Carolina. Mark Teixeira comps were being placed on him and some felt the Texas Rangers got a steal when he fell to the 11th overall pick in the 2008 draft. He was a switch hitter with power, batting skills and plate discipline. He enhanced his prospect status early as a professional. He slashed .328/.449/.481 in Double-A and in 2009 and was the headline chip in the package that sent Cliff Lee from Seattle to Texas in 2010. But entering this season, it seemed like stardom was never going to arrive for Smoak. He generally struggled from 2010 to 2016, over seven partial or full major league seasons. He entered this season with a career WAR total of 0.2. So what is behind this significant turnaround in performance and underlying skills? Smoak entered play Friday with a career bests in average (.296), on-base (.371), slugging (.579) and wRC+ (149) and home runs (33), including a game-winner Thursday. This season he has been worth 3.5 WAR. And as Jeff noted back in June, Smoak’s two-strike contact improvement — from 63% last season to 81% this season — has really fueled much of the breakout. Smoak has never had so much two-strike success before. In terms of two-strike contact rate, between 2014 – 2016, Smoak ranked in the 4th percentile out of all players. So far in 2017, in the same statistical category, Smoak ranks in the 73rd percentile. that right there is enormously significant, as Smoak is just tougher than ever to put away. While his swing rate (43.3%) is in line with his career average (43.5%), while his out-of-zone swing rate (27.3%) is also in line with his career rate (27.2%), Smoak is enjoying a career best contact rate (80.6%). The mark is up dramatically from the lowest contact rates of his career which occurred last season (72.1%) and in 2015 (73.2%). Those gains have held up pretty well, though his contact rate has eroded a bit since June. Still, Smoak does seem different and it’s now the middle of August. What is going on here? I was curious so I went to the source himself. That does sound crazy because his previous single season, career best home run total was 20 set back in 2013. He is not, and does not profess to be, part of the air-ball revolution. He has a fly-ball rate of 41.7% for his career and 41.3% this season. Smoak said for so long in his career he was trying to generate power and what he has discovered is that he did not need to. I have heard Chipper Jones before discuss the idea of a hitter needing multiple swings to be successful, to be able to adjust to locations and speeds. And perhaps we’re seeing some of that from Smoak this season. Jeff noted that Smoak has become less susceptible to chasing out of zone. 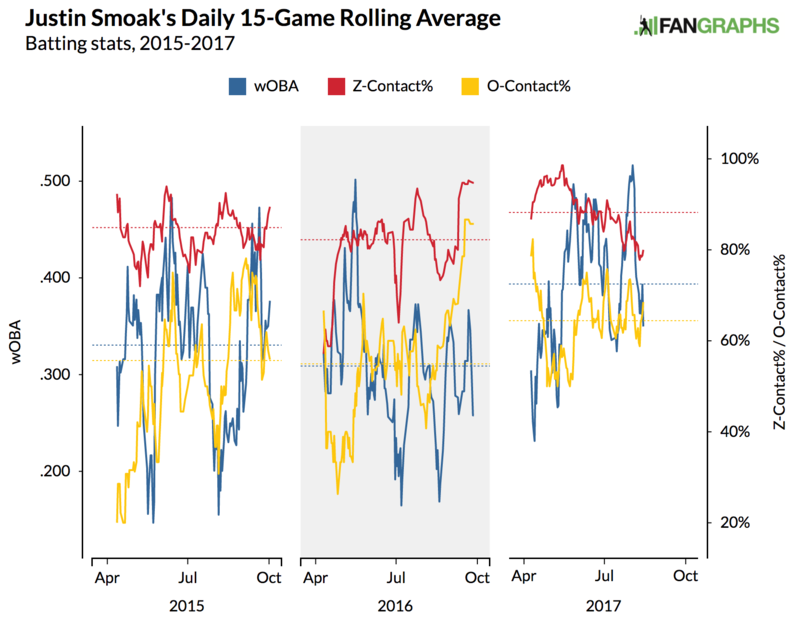 Smoak has also become a better hitter for contact not only in the zone but out of the zone. Consider Smoak’s contact rate on out-of-zone pitches the last three seasons — 51.6% (2014), 51.3% (2015) and 52.3% (2016) — compared to his carer best mark this season (66.7%). Smoak’s wOBA on out-of-zone pitches is .296 this season compared to his .273 mark from the 2014-16, according to Baseball Savant. For his career, Smoak has batted .136 and slugged .233 against curveballs. Last season he hit .120 against curveballs and slugged .120 against the pitch. For his career, Smoak has hit .181 and slugged against .324 sliders. Last season Smoak hit .125 and slugged .225 against slidrs. Smoak has hit .265 against curveballs and slugged .449 against the pitch. Against sliders? Smoak is batting .286 and slugging .500. “Just kind got to a point where I wanted to get back to where I was as a young guy in the minor leagues,” Smoak said. “I might hit one ball out in BP [as a prospect]. Next thing you know, I’m launching balls in BP [in the majors]. It’s cool, it looks great, and in games it’s the total opposite. There was always talent residing within Smoak. He is a switch-hitter with an borderline elite batting eye and raw power. He has posted above-average exit velocities and barrel ratios, according to Statcast data. But not every player takes the immediate path to stardom that a wave of young players has enjoyed in recent years. Smoak had to find his way, and that way was to apparently to learn to do more with less. Smoak had to wait but he might have finally arrived. We hoped you liked reading Justin Smoak Explains His Own Breakout by Travis Sawchik! It’s funny – in the offseason I read some “smoak breakout” articles, and went back and googled the topic and found similar articles in every single season for the last 6 years. So I was more than skeptical, but am pretty damn happy it finally came true.